The tour guides have it all wrong. Waipio Valley – located on the Island of Hawaii (the Big Island) – normally only gets a couple of short sentences. While the big resort areas, the volcano parks, and the shopping districts get all of the focus. I almost assumed there wasn’t anything special or worthwhile about making the trip out to Waipio. Why don’t the tour guides mention that? Could the journey to paradise ever be easy? In the case of Waipio Valley, the answer is – literally – definitely not! 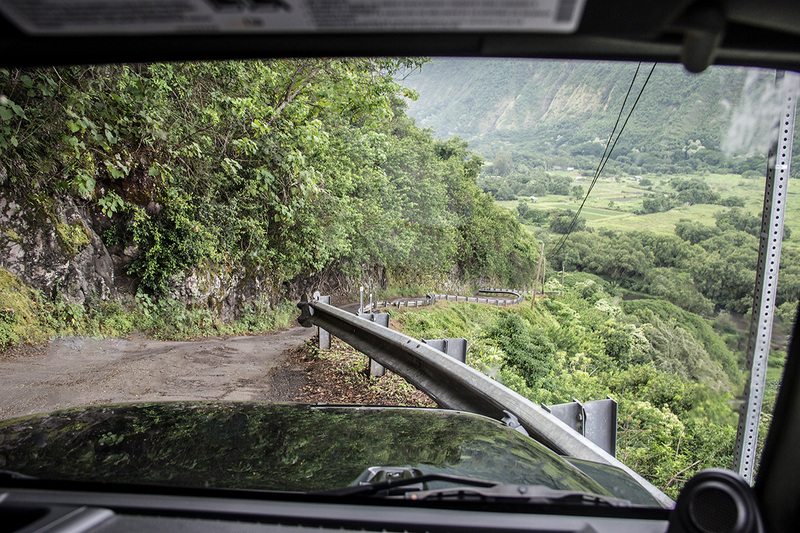 We had to rent a 4-wheel drive Jeep to make the trip down into Waipio Valley. The “road” was one of the narrowest and steepest I’ve ever seen. (It’s actually one of the steepest in the country!) And it was filled with winding curves on the edge of a cliff. When other cars passed from the opposite direction, Chris had to pull into the vegetation along the side of the road to make room. Once we made it to the valley floor, the first thing that caught my eye was the unique black sand beach. The dark color is from the volcanic lava that once formed the island. What I noticed, especially: how soft and warm it was under bare feet! The next thing that caught my attention: several darkly colored wild horses foraging through the tropical forest just beyond the beach. The horses were clearly thriving and perfectly relaxed around people. Getting the chance to watch these peaceful, graceful creatures – all while relaxing on the beach – just added to the magic of Waipio. Beautiful, incredibly huge flowers that are popping with vivid color are everywhere on the Big Island. What I loved about the bright flowers of Waipio, though, was how they grew on vines right along the sand. When we made our journey down to Waipio Valley, Chris and I were actually the only two souls on the beach (aside from the wild horses). 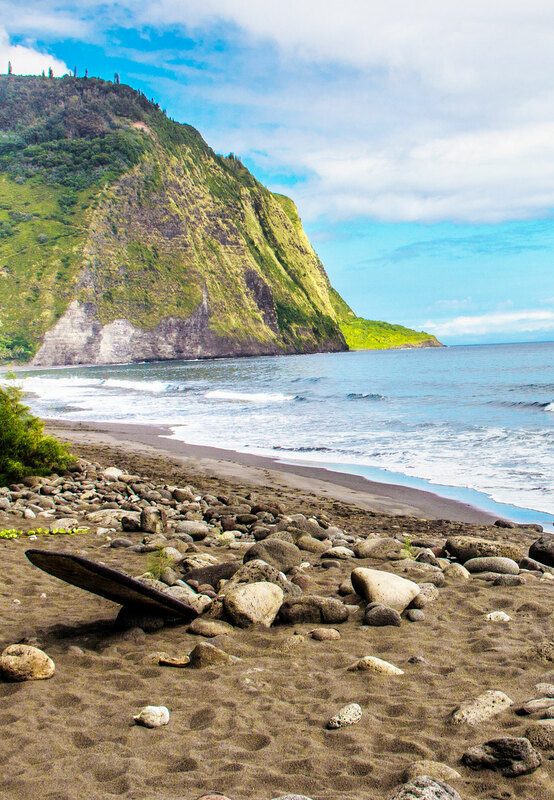 Our bed and breakfast hosts told us that Waipio is open to the public and a popular spot for surfers. But it’s usually completely deserted during weekdays, when most locals are at work. But just taking it all in for a few moments – the stunning power of the giant falls in the thick of the lush green rain forest – was enough. This photo was taken from the beautiful one-bedroom bed and breakfast (where we stayed for a couple of nights) located at the top of Waipio called Waipio Rim B&B. The experience of being at this breathtaking spot at the top of the cliff was something I hope I’ll never forget. Picture heavy and warm tropical air, black sand beaches stretching across the shoreline, sweeping cliffs covered in the lush green of the rainforest, birds singing and frogs croaking loudly, and vivid blue waters stretching endlessly into open sky. We were also able to find a very similar view at Waipio Valley Lookout, which was open to the public. The tour guides say that, for centuries, many considered Waipio as sacred land. And many still do. After seeing it all with my own eyes, I understand why!